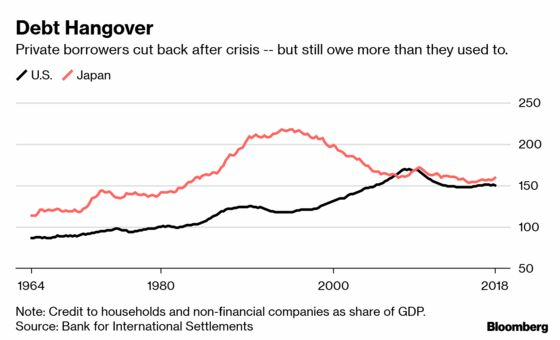 (Bloomberg) -- Monetary policy is supposed to work like this: cut interest rates, and you’ll encourage businesses and households to borrow, invest and spend. It’s not really playing out that way. 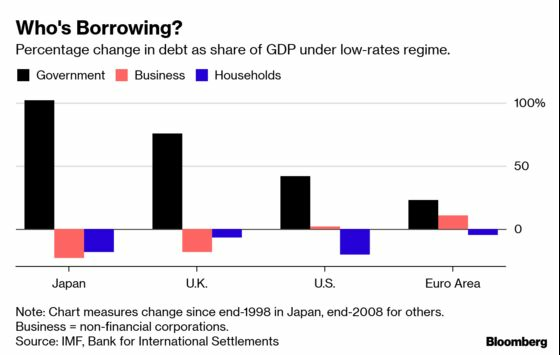 In the cheap-money era, now into its second decade in most of the developed world (and third in Japan), there’s been plenty of borrowing. But it’s been governments doing it. The numbers help explain a growing sense that central banks, which took emergency action to pull economies out of the 2008 slump, may not be able to repeat the trick in another downturn. They’re even facing broader questions about their independence from politics, a cornerstone of economic management in rich countries. In the past decade, still-indebted private actors were mostly unwilling to dive back into the red, even at ultra-low rates engineered by the central banks -- while governments could and did. The dividing line is starting to look fuzzy. Some analysts say it’s time to redraw it. Most economists see that as a slippery slope that could lead to prices spiraling out of control. That’s one reason they’re dismissive of Modern Monetary Theory, a school of thought which supports bigger deficits, and is relaxed about central banks financing them. MMT economists say public debt is generally safer than the private kind, which snowballed in the age of monetary policy dominance before disaster struck. The question is a live one, and not just in academia. It gets bumped up the agenda every time President Donald Trump snipes at the Federal Reserve. There are similar political pressures in other countries. Also growing are calls for governments to boost economies if central banks can’t. Should governments a) run larger deficits because low rates allow them to or b) because central banks can buy their debt and keep rates low? In a sense it doesn’t matter. In both cases, the answer is that governments should run larger deficits. In Japan, there’s been more cooperation between the people in charge of budgets and those who manage interest rates than pretty much anywhere else. When the government and central bank work in tandem, “synergy effects from both sides can produce stronger economic stimulus,” former BoJ deputy governor Kikuo Iwata, a key architect of the plan, said at the Bank for International Settlements last year. He’s argued that monetary policy has done what it can, and that Japan -- which already has the world’s biggest public-debt burden -- needs even more fiscal stimulus to complete its escape from deflation. In the heat of crisis, collaboration between governments and central banks has been fairly explicit almost everywhere. In 2008 in the U.S., for example, the Fed’s Ben Bernanke and Treasury’s Henry Paulson rapidly formed a tag-team. In Europe a few years later, Mario Draghi’s pledge to do “whatever it takes” to preserve the single currency gave Italian government debt a backstop, and brought yields down from the brink. Public borrowing at low rates proved to be an effective way of putting a floor under the Great Recession. 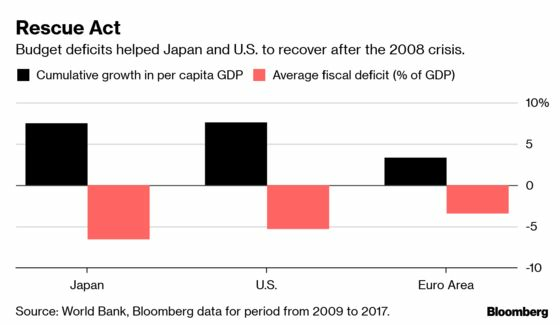 The U.S. and Japan did more of it than Europe, where there’s no central authority able to tap credit markets and spend on the continent’s behalf -- and they’ve had better recoveries. The problem for policy makers is that what once looked like a short-term crisis stopgap has in fact stretched out for years -- making it increasingly likely that the next downturn will arrive with interest rates still low. In the U.S., a plurality of economists expect a recession in 2020, a presidential election year. The Fed will have some room to cut, though less than the 500 basis points reckoned to be its typical response to a shrinking economy. Its peers have much less, if any. And even if they had, recent history says it would likely be governments that took advantage of the lower rates. The worst recessions to hit developed countries lately (and some emerging markets too) have followed rapid buildups in private credit -- one reason why central banks have found it hard to inject stimulus. Richard Koo, chief economist at Nomura Research Institute, coined a term for it: balance-sheet recession. And today, years into the recovery, households and businesses are still highly indebted by past standards. Unlike governments, they haven’t been eager to borrow more money, however cheap it is.